Help me become #NOLARoyalty at Rock n Roll Marathon Series! In true Mardi Gras fashion, Rock ‘n’ Roll New Orleans will crown a King & Queen of race weekend festivities! The King and Queen will be revered by all participants, and will receive the royal treatment during race weekend! Hi lovelies - I have a huge favor to ask. Please visit the #NOLARoyalty page on Rock n Roll Marathons page and vote for us to become King and Queen of the New Orleans race weekend!! 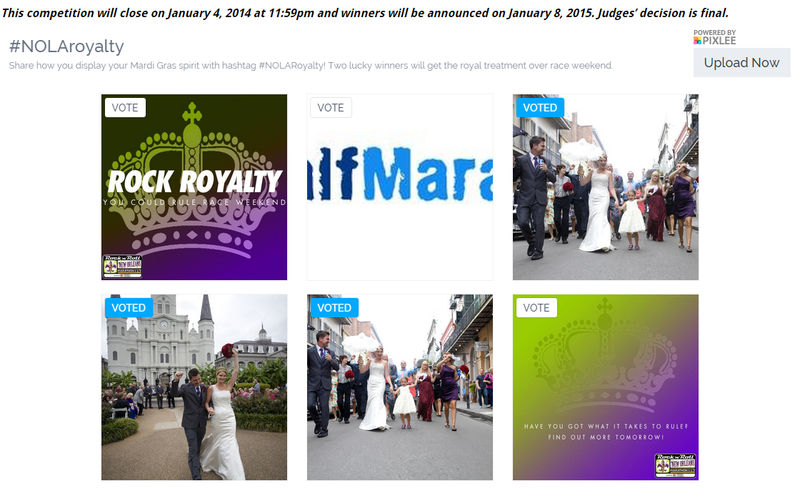 Post your image to the #RnRNOLA Facebook page or your personal Instagram or Twitter page using #NOLARoyalty. The photos will automatically appear on the website as shown above but you must use the hashtag #NOLARoyalty for this to happen! This competition will close on January 4, 2014 at 11:59pm and winners will be announced on January 8, 2015. Judges’ decision is final. And don't forget to enter my Rock n Roll Marathon Series giveaway - there are a few days left for a chance to win an entry to any US based RNR Race.